Does Thinking About God Have a Down Side? Research led by University of Waterloo psychologist Kristin Laurin has yielded a result that’s surprising to me, and that raises questions about a possible unwanted effect of work by many thinkers, including myself. How can you be sure people have recently had “God representations” in mind? One way is to give them the task of composing sentences from lists of words they are given, and include words like “God”, “divine”, sacred” on the lists. That was the set up for one group of participants. Another group of participants was given the same task with other lists that contained none of those words, but did contain words for positively valued items (e.g., “sun”, “flowers”, “party”). A third group did the same task using lists with neutral words. To get at the effect of the differences among these groups, Laurin and her colleagues asked all participants to do a new verbal task. They were told that high scoring on this second task was a good predictor of success in their chosen field (engineering, as it happens). The task was to write down as many English words as they could in 5 minutes that are composed of just the letters R, S, T, L, I, E, and A. The key result – predicted by the researchers but surprising to me – was that participants who had received the list of religion-related words on the first task did less well on this second task than the other participants – they averaged 19.5 words, compared to 30.4 and 30.3 for the participants who had gotten non-religion-related words that were positive, or neutral, respectively. Several weeks before this experiment was conducted, the authors had given a questionnaire to their participants that included a religion identification question. They were thus able to test whether their experimental result depended on participants’ religious classification. They found that their result did not depend on religious classification, even when that classification was “atheist’ (about half of the participants in this study). The authors suggest a mechanism for their observed effect, namely that exposure to the religion-related words in the lists in the first task “activated the idea of an omnipotent, controlling force that has influence over [participants’] outcomes”. In a second study, they found experimental support for this mechanism, and concluded that “only those who believed external forces could influence their career success demonstrated reduced active goal pursuit following the God prime” (where receiving the “God prime” = receiving the religion-related lists in the first task). This conclusion gives me pause, for the following reason. As is evident from several posts on this and several other blogs, recent books, and newspaper reports, there are many lines of research that show the importance of unconscious processes. A large number of effects on our behavior come from circumstances of which we are unaware, or circumstances that we consciously notice, but that influence our behavior in ways we do not realize. In the last decade, and continuing today, our dependence on processes that are unconscious, and therefore not under our control, has become more and more widely publicized. It thus seems that there is a serious question whether the increasing recognition of the effects of unconscious processes may have an unwanted, deleterious effect of reducing our motivation to actively pursue our goals. 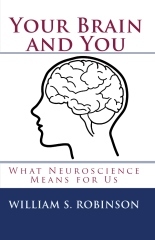 Your Brain and You resolved somewhat similar issues about the relation of unconscious processes to responsibility and certain attitudes toward ourselves. But, of course, it could not consider this recent experiment, and it did not address the question of what effect the recognition of our dependence on unconscious processes might have upon our degree of motivation to pursue our goals. I do not think I have an answer to this question, but I wonder whether the following distinction may turn out to be relevant. Getting people to think about a god is getting them to think about an agent – an entity with its own purposes and ability to enact them. On the other hand, accepting that there are causes of behavior that lie beyond our control is not the same as accepting that our outcomes depend on another agent’s purposes. So, it seems possible that the growing recognition of the importance of unconscious processes to our thoughts and actions may not lead to reduced motivation to achieve our goals. This entry was posted on Monday, February 13th, 2012 at 8:48 pm and is filed under Control. You can follow any responses to this entry through the RSS 2.0 feed. You can leave a response, or trackback from your own site. 2 Responses to Does Thinking About God Have a Down Side? I wonder how non-engineer types would have faired in the same study. Seems engineers are of a certain breed. Perhaps Liberal Arts majors or more or less susceptible to this effect? Interesting question — to which I do not know the answer. However, there was nothing in the authors’ discussion that suggested any reason to expect dependence on any particular field. They discuss several possible explanations, but none of them work through explicit thinking about divine properties. The participants were debriefed after the experiment, and none of them had been aware of any special relation between the first (priming) task and the second. So, it does not seem that the participants could have been applying any explicit “engineering principles” or calculations. Of course, there could be a habit of unconscious mind, or something about one’s general outlook that’s relevant. But it would take more experiments to show that.